Halliburton has agreed to plead guilty to destroying evidence related to the 2010 Gulf of Mexico oil spill, the US department of justice said on Thursday. WASHINGTON — The Justice Department on Wednesday sued BP and eight other companies in legal action that could force the firms to pay tens of billions of dollars in fines, cleanup costs and economic damages related to the Gulf of Mexico oil spill. Scientists say they have for the first time tracked how certain nontoxic elements of oil from the BP spill quickly became dinner for plankton, entering the food web in the Gulf of Mexico. Most news gets stale with time, but this one gets better. Listen to Enbridge's John Carruthers blather on about Enbridge's "learnings" in Wisconsin where it had to "mitigate some issues ... in terms of environmental violations". 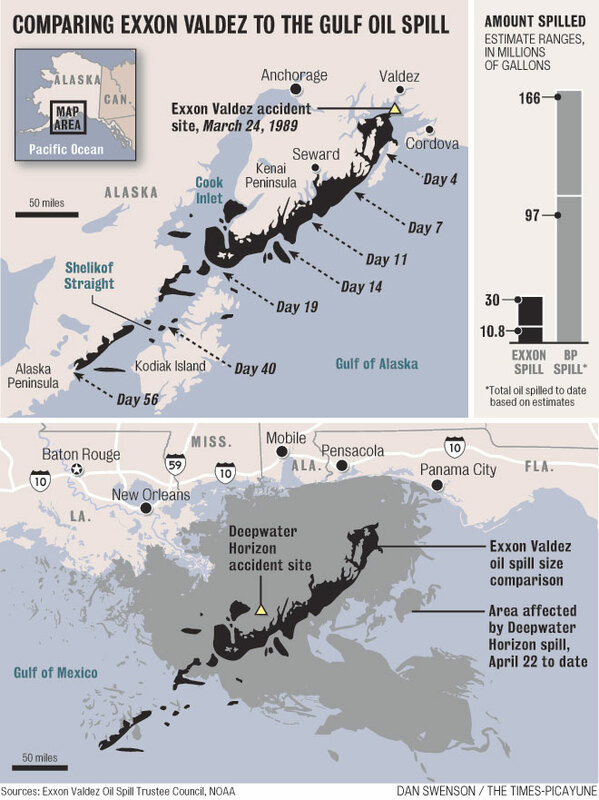 The oil and gas industry's offshore safety and environmental record in the Gulf of Mexico has become a key point of debate over future drilling, but that record has been far worse than is commonly portrayed by many industry leaders and lawmakers. KENNER, La. — The emergency alarm on the Deepwater Horizon was not fully activated the day the oil rig caught fire and exploded, killing 11 people and setting off the massive spill in the Gulf of Mexico, a rig worker on Friday told a government panel investigating the accident.The worker, Mike Williams, the rig’s chief electronics technician, said the general safety alarm was habitually set to “inhibited” to avoid waking up the crew with late-night sirens and emergency lights. Retired Coast Guard Adm. Thad Allen on Sunday evening agreed to allow a cap to continue to block the flow of oil from the Deepwater Horizon wellhead, despite the discovery of oil or natural gas seeping from the floor of the Gulf of Mexico at a location away from the well. It's all so familiar. A technological disaster, then a presidential commission examining what went wrong. And ultimately a discovery that while technology marches on, concern for safety lags. Technology isn't as foolproof as it seemed. They've stopped the flow ... temporarily. Click here to see how. BP froze activity on two key projects Wednesday meant to choke off the flow of oil billowing from its broken well in the Gulf of Mexico after days of moving confidently toward controlling the crisis. BP could plug its gushing Gulf oil well by the end of July, ahead of a projected target of August, if weather conditions permit and the drilling of relief wells keeps going smoothly, the newly appointed executive in charge of the company's response said Friday. The ultimate solution for stopping the gusher is still a relief well. 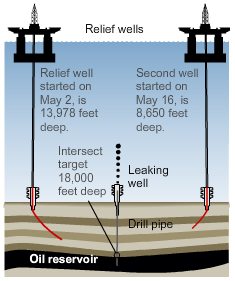 Two are being drilled in the Gulf of Mexico, one as a backup. 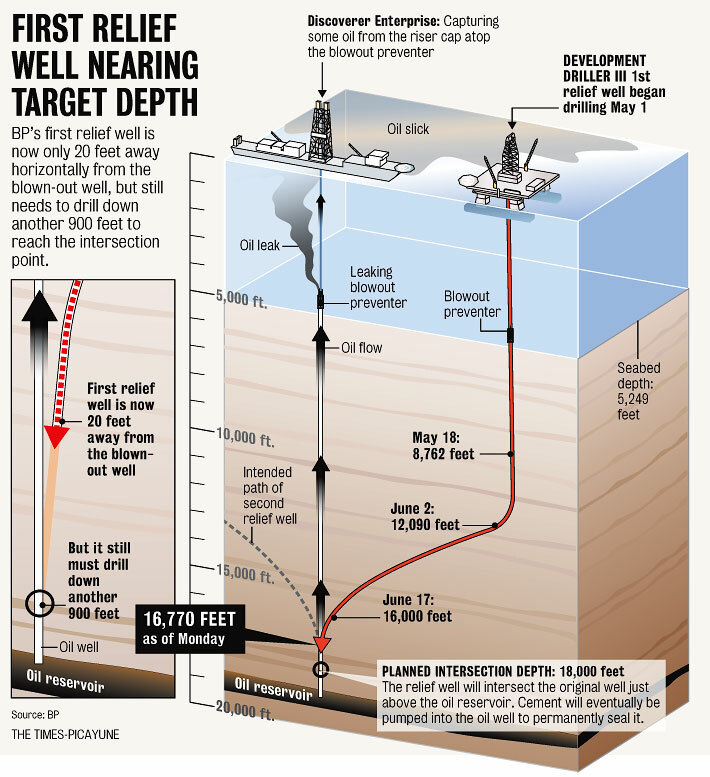 The primary well, which was started nearly two months ago, had been drilled to about 16,770 feet below the water's surface by Monday [June 28] morning. 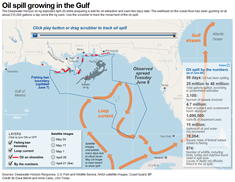 NEW ORLEANS, Louisiana (ENS) - The amount of oil spewing from the broken BP wellhead in the Gulf of Mexico is likely 35,000 barrels per day, National Incident Commander U.S. Coast Guard Admiral Thad Allen said today, based on a new estimate from the Flow Rate Technical Group. He said BP's containment system captured about 25,000 barrels yesterday, the largest daily amount collected since the well was partly capped earlier this month. The timing of the catastrophic 1979 accident at Three Mile Island couldn't have been better for opponents of nuclear power.